Last major update issued on December 8, 2006 at 05:10 UTC. The geomagnetic field was unsettled to minor storm on December 7. Solar wind speed ranged between 561 and 761 km/s (all day average 647 km/s - increasing 151 km/s over the previous day) under the influence of a high speed stream from CH250 during the first half of the day. After 11h UTC there is some evidence of the presence of a non coronal hole related component in the solar wind. From 11:11 to 11:14 UTC solar wind speed increased by more than 100 km/sec. Additionally there was a fairly rapid increase in the proton levels as observed by ACE just before this time. The change in solar wind data could be explained by the insertion of a high speed component from the CME associated with the X9 flare on December 5. The interplanetary magnetic field suddenly became much stronger and had strong southward excursions after 04h UTC on December 8. This is likely the arrival of the CME associated with the X6.5 flare on December 6. Solar flux measured at 18h UTC on 2.8 GHz was 95.8. The planetary A index was 25 (STAR Ap - based on the mean of three hour interval ap indices: 25.0). Three hour interval K indices: 54544333 (planetary), 44443333 (Boulder). At midnight there were 2 spotted regions on the visible solar disk. The solar flare activity level was moderate. A total of 5 C and 1 M class events was recorded during the day. Region 10927 was quiet and stable. Region 10930 has lost much of its complexity after the X6.5 flare on December 6. That flare appears to have destroyed the magnetic delta structure that was a key factor for the production of the huge flares. M flares are still possible and there is a small chance of an addiotnal X class flare. Flares: C1.9 at 00:34, C2.0 at 03:36, C6.1/1F at 04:45, C1.1 at 11:48, C1.2 at 15:15 and M2.0/1N at 19:13 UTC. December 5: While no LASCO images are available from the time after the X9 event, such events are often associated with large and fast CMEs, so there is at least a chance of a flank impact from the CME produced by the event. December 6: No LASCO images available. It is likely that a large and fast CME was produced by the extremely bright X6.5 flare. 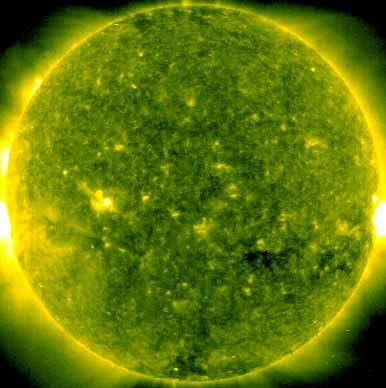 This CME could reach Earth on December 8. December 7: No obvious partly or fully Earth directed CMEs were detected in very incomplete LASCO imagery. The geomagnetic field is expected to be unsettled to major storm on December 8 due to CME effects and quiet to active on December 9-10. Long distance low and medium frequency (below 2 MHz) propagation along east-west paths over high and upper middle latitudes is very poor to useless. Propagation on long distance northeast-southwest paths is very poor. Monitoring remarks from a location near N58E06: The only audio noted from a trans Atlantic station was on 1480 kHz where I heard a weak unidentified signal.